As always, I really enjoyed the BFI London Film Festival this year. The list of great films that I saw during the previews include: Filmworker, the wonderful documentary about Stanley Kubrick’s right-hand man, Leon Vitali, who never truly got the recognition that he deserved; Rollerdreams – also a great documentary, this time about the history of the black roller-skaters in downtown LA, who made the area the tourist attraction that it is; and You Were Never Really There – the powerful thriller starring Joaquin Phoenix as an unstable ex-veteran who now specialises in ‘finding’ people and gets more then he bargains for with his latest job. It had been a great couple of weeks. But I hadn’t quite had a ‘Toni Erdmann moment’ – that feeling that I was watching something really stand-out and just that little bit special, which I absolutely felt when I was crying with laughter during that film. And then on the last day of the previews, I had three of them! I saw the sublimely-brilliant Thai exam-cheating caper, Bad Genius; the mesmerising Zambian-based, I Am Not A Witch; And Three Billboards Outside Ebbing, Missouri. What a marvellous day that was! Beautifully written and directed by Martin McDonagh – the filmmaker behind the cult classic, In Bruges, as well as Seven Psychopaths – Three Billboards deserves to win all the awards (with Bad Genius coming a very close second, followed by the extraordinary I Am Not A Witch …). Set in Missouri, America, as the title suggests, Frances McDormand plays Mildred, the seemingly hard-faced working class woman who will go to absolutely any lengths to pressure the local police into solving her daughter’s murder. Even if it alienates her son, her viscous ex-husband and most of the community. After seven months of silence from the police who are supposed to be investigating her daughter’s death, she takes drastic action to focus their minds. And boy, does she get their attention. Woody Harrelson plays Chief Willoughby, the kind-hearted head of the local police department, full of good intentions but lacking in results, and as such Mildred’s main target. Sam Rockwell is Dixon, the child-like, pig-ignorant, racist cop under Willoughby’s command, who quickly and repeatedly justifies his reputation for brutality. Extremely violent, coarse and heart-breaking, underpinned with brilliantly dark humour that will have you choking on your popcorn with laughter, and dialogue so razer-sharp that I can’t wait to get my hands on the script. This kind of in-your-face film storytelling might not be for everyone. The racist language is close to the bone, demonstrating the backward attitude still prevalent in some parts of America. The N-word is bandied about a lot and when a black police chief arrives he calls the lazy officers a bunch of ‘crackers’ (a racial slur, originally used against poor white people). After a particularly shocking assault by Dixon, his mother can’t understand why he’s putting up with being chastised by a black police chief. He laments that: “It’s changed in the South”, to which she replies: “It shouldn’t have”. Personally, I think that, like it or not, the reality is that there are still many people who hold such attitudes. This film merely highlights their ignorance. Packed with an amazing cast, putting in great performances, such as the aforementioned Woody Harrelson – who I always adore – and Peter Dinklage as feisty James, a small guy with a big heart who, unfortunately for him, has a crush on the one-track-minded Mildred. But it’s the absolutely outstanding performances from Frances McDormand and Sam Rockwell that will blow you away. Her portrayal of a devastated mother coping with the truly heinous crime committed against her daughter, with pure bloody-mindedness and steely determination, is totally and utterly convincing. As are her tiny moments of compassion and weakness, that we’re allowed to glimpse. While Sam is a tour de force as the shocking, but surprisingly-complex, Dixon. I must admit, there’s an odd scene with a CGI’d deer, that didn’t quite work for me. 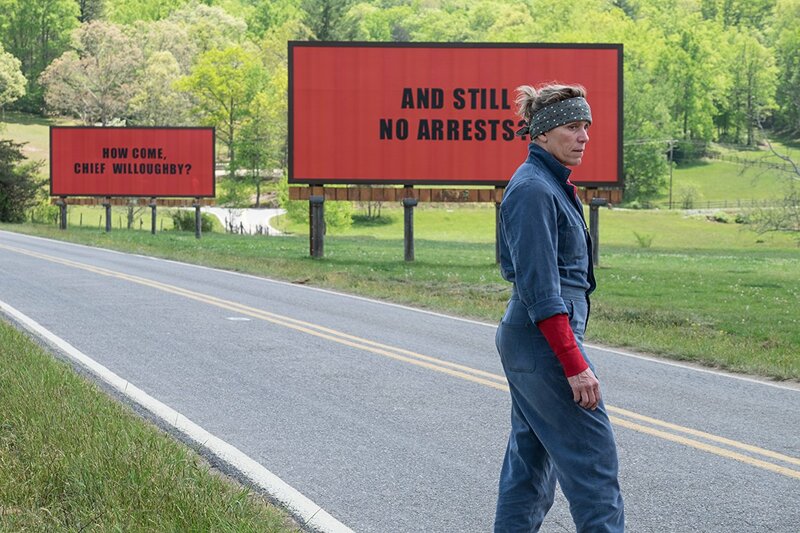 But, hey, nothing’s perfect and even that can’t stop me absolutely loving Three Billboards! It’s a remarkable film. Go see it! This entry was posted in America, Film, London Life and tagged BFI, comedy, drama, film, Frances McDormand, London, London Film Festival, Martin McDonagh, Peter Dinklage, Sam Rockwell, thriller, Woody Harrelson. Bookmark the permalink.